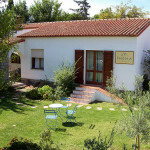 Phocea is a relaxing white house very close to the beach called “La Cinta”. It is ideal for those who want to spend their holidays even in the low-season period, and very comfortable for couples with little babies. Phocea is situated in a very central position from where it is easy to get to the beach or to the city centre walking or by bycicle on the summer evenings. In Phocea there are two rooms for the guests. All rooms have private bathroom, wi-fi access and an indipendent entrance from the garden.